I totally know how Madonna feels in this photo. I got to bed around 4am this morning then got up around 10:30. Luckily, I had some Top Pot doughnuts to ease the pain. Now, though, there's laundry to be done and plants to be watered. And it's a grey foggy day in SF. What a welcome home. 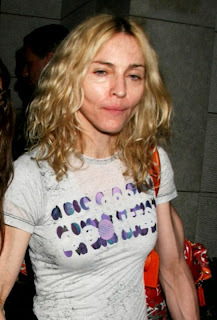 Poor Madge, at least they didn't catch her without make-up. I guess this is what Kabala and lack of any real talent will do to you.